Born on Market Street in Denton in 1903, Harry was immersed in art from childhood; his father William formed the Hyde Art Group with his friends.Soon Harry was attending the Hyde School of Art on Saturday mornings and, upon leaving school at 14, he continued his studies by attending evening classes at Manchester School of Art, sharing the classroom with fellow student L.S. Lowry. By the age of 22, Harry was a proficient artist but he still wanted to learn more, so when he heard that the renowned and eccentric artist Walter Sickert was starting a class in Manchester, he was the first – and youngest – to sign up. Harry was then employed as Head Artist at a Manchester Advertising Agency and produced topical cartoons for the Manchester Evening News, but an opportunity arose for him to move to Cornwall to devote more time to painting and do some teaching. Harry couldn’t refuse. 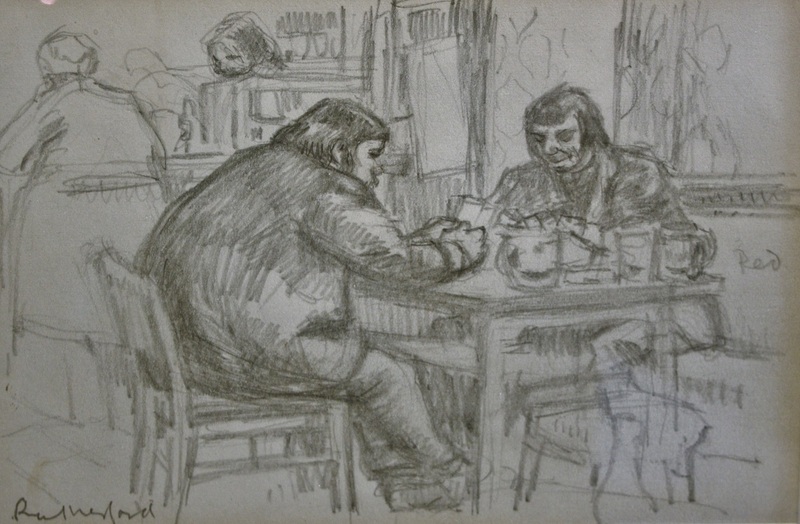 The opportunity also allowed him to develop his own style, distinct from his mentor Sickert’s. In 1930, he entered his painting ‘Penzance’ to the Royal Academy, who accepted it for their summer show. Commissions from the Duke of Devonshire followed; Harry had arrived as an artist. At the outbreak of the Second World War, Harry joined the RAF, who employed him to paint skies in exact detail to assist in their camouflage training.Alongside his war work, Harry continued to paint his own work, though sadly, much of it when his studio was destroyed during an air raid. In peacetime Harry returned to the screens and to a different attitude to his accent.After working once more on ‘Cabaret Cartoons’, he was offered his own show, ‘Sketchbook’, on children’s television.The series ran for six years, with Harry pioneering the idea of art being created live on TV long before the days of Rolf Harris and Tony Hart. At the end of his series, he moved back to Hyde, taking up a teaching position at the Regional College of Art in Manchester. Apart from a brief excursion to Borneo at the invitation of the governor – he became the first Western artist to exhibit in the country in 1957 – Harry remained in Hyde for the rest of his life. In 1961, he was elected President of the Manchester Academy, holding tenure for eight years, while continuing to paint at his own studio.That studio was in Nelson Street in Hyde, in the adjoining house to the Rutherford family home he had lived in as a child and which he now shared with his brother Donald and cat Sugden. In 1985, after a period of ill health, Harry died, leaving a legacy of excellent paintings, many of which were of local scenes, and a collection of fantastic memories for anyone who knew the vivacious, humorous and talented man.